Ever wondered what it takes to build a successful mobile business in India? How many red tapes should one go through to get the required clearances? What should be done to maximise revenue potential? 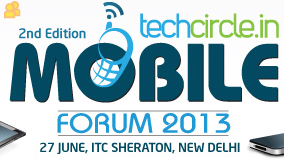 Well, the upcoming Techcircle Mobile Forum 2013 will provide answers to all these queries and more. The keynote panel of the event, 'Building Large Mobile Businesses In India: The Road Ahead' will focus on mobile-centric opportunities in the country. The panel, moderated by Rahul Chandra, MD, Helion Venture Partners, will cover aspects such as the innovation that is taking place across mobile categories and the tools required to create large, sustainable and scalable mobile businesses in the country. With users increasingly engaging with mobile products, what is the future of mobile technology in a diverse market such as India? How do companies maximise revenue potential across all platforms? These and many other key questions will be answered in the course of the panel. Since it is said that any panel is only as good as its speakers, we bring to you Madhu Nori, head of operations, Bharati Soft Bank; Hitesh Oberoi, MD and CEO, Info Edge; Badri Sanjeevi, CFO, People Group and CEO Mauj Mobile; and Mohit Bhatnagar, MD, Sequoia Capital. Need we say more? Also, if this is not reason enough to attend, the forum will cover areas such as what lies next for mobile commerce; how one masters the business and economics of mobile apps; innovation and traction in mobile-led entertainment products; mobile advertising; the next phase of mobile monetisation; and mobile payments and mobile handsets. In addition, the forum will have a one-of-its-kind Techcircle Runway, a 'special' session (and we stress on the word special) where five handpicked mobile apps/products/services will be showcased. The startups will make presentations on their products, innovation, market opportunity, business models and how they plan to disrupt existing markets to create value. Techcircle Mobile Forum, now in its second edition, will be held on June 27 in New Delhi, bringing together India's top mobile innovators, entrepreneurs and marketing heads across sectors, as well as venture capitalists and consultants, to discuss and debate new-age mobile-based products and services, and also to discover how they are changing many areas of Indian consumption and traditional business channels. For registrations, write to: kanika@vccircle.com or dial 0120-4171111.